The Orange tree (aka Sweet orange) is a species of flowering plants with the scientific name Citrus sinensis. It is one of many different types of citrus plants and one of the main crops grown for income in Florida. 4 Uses: Food, Medicine, Etc. The Sweet Orange can reproduce sexually and with a special method called nucellar embryony. They can self pollinate themselves which can only happen if both gender organs are on the plant. Nucellar embryony is the formation of maternal clonal embryos through normal fertilization. When plants pollinate normally they are usually pollinated by honeybees. The bees then transfer the pollen from the male organ of a flower to the female organ of another flower. The male part is called the Stamin and the female part is called the pistils. These trees usually produce fruit and seeds for about 50 years. 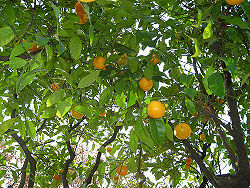 Citrus sinensis fruits hanging off of the trees. Oranges are used for many different uses, but most of them are about food or drink. 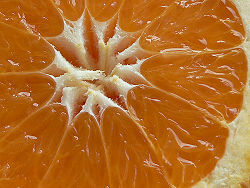 Oranges are used for flavoring, candy, food, and drinks. Many people enjoy oranges because of their taste, but other people eat them because they are an excellent source of vitamin C. The orange can be made into juice, marmalade, or jelly. Orange leaves are also used by the Spanish, where they are dried up and made into tea. Oranges and other citrus plants are rich in Vitamin C. Oranges are often used in fruit cups, juice, and candy. In Africa, oranges are used to make a soup. The orange peel is used by some people to help repel slugs. Some medicinal uses for orange are that they are eaten to help delay fever, the peel is used against acne, and the pulp is used to fight skin disease. The seed extract is used to help fight off malaria and the leaves are used for ulcers and boils. A mix of the dried leaves and flowers is used as a antispasmodic, cardiac sedative, antiemetic, digestive and used to stop flatulence. Orange trees are also used for shade. This page was last modified on 10 April 2009, at 15:01.